Lalibela takes special care to ensure that heartfelt service combines with rewarding game viewing, exclusive accommodation and delicious food. Lalibela Game Reserve's central ethos is to ensure that what visitors experience is the best safari vacation of their entire life. As Lalibela is located in the Eastern Cape, it is not only malaria-free but spans 5 of the 6 completely different ecosystems in South Africa. This results in an amazing and breathtaking diversity of flora and fauna. All animals, including the predators such as Lion, Cheetah and Leopard, roam freely throughout the entire reserve, which offers you the ultimate safari experience. Having no public roads through the reserve's property, Lalibela is unique in the Eastern Cape. Lalibela Game Reserve is offered at one of 3 lodges - Tree Tops Safari Lodge, Lentaba Safari Lodge and Mark's Camp - where guests can enjoy a comfortable stay and embark on daily adventures. 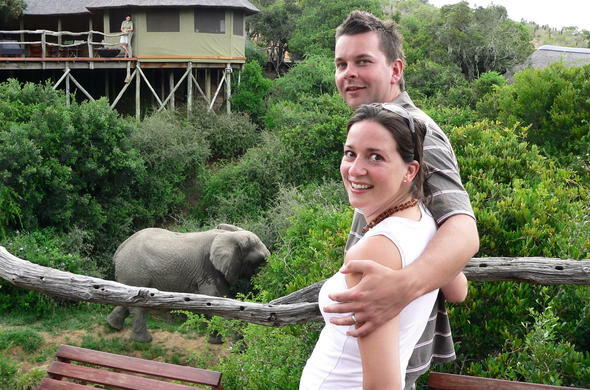 Kids are welcome to stay in the malaria- free Lalibela Game Reserve and enjoy specially designed children's programs. Lalibela Game Reserve features a multipurpose Conference Centre and Boma which can be used for conferences, product launches, weddings, theatrical productions and special occasion celebrations. The theatre-style main conference room has 100 seats. The boardroom at Lalibela can accommodate 18 delegates.